Oh man. There are a lot of things for Jays fans to be excited about so far this season: Colby Rasmus looks like he’s figuring it out; Edwin Encarnacion has figured it out to the point that he’s been officially handed the cleanup hitter’s role; Brett Lawrie is being Brett Lawrie and that gets people excited even if he’s not yet playing as well as he’s capable of playing; the pitching! I never thought anything could make me root for an NL West team other than the Giants, but now I know I was wrong. John McDonald can do that to a guy. McDonald and Aaron Hill were traded to the Arizona Diamondbacks (who are one game up on the Giants at the time of writing) this afternoon for second baseman Kelly Johnson. The press conference is going on right now and, from the sounds of it, McDonald and Hill both want to come back to Toronto. McDonald even said he’s already talked to Alex Anthopoulos about that possibility (he’s a free agent after this season). McDonald’s defence and work ethic are enough to win over fans and coaches anywhere. Hill’s been great in the past, but has struggled both this season and last. He seems like a perfect “just needs a change of scenery” candidate and there’s a real possibility a move to the NL and it’s AAAA competition could be just the change he needs. As for who the Jays are getting… Anthopoulos has been after Johnson for a while now. After the 2009 season, the Jays were rumoured to be trying hard to sign Johnson to play leftfield, but Johnson chose the D’backs because he wanted to stay at second. I think it’s safe to say he’ll be taking Hill’s spot in the infield when he arrives in Toronto. Hill and Johnson are both 29. Hill’s got parts of seven seasons under his belt, has a career slash line (batting average/on-base percentage/slugging) of .265/.318/.413 and has been worth 15.9 wins above replacement, while Johnson’s posted a .260/.342/.442 and 14.2 WAR during his time in the big leagues. Statistically, it seems like the Jays won this trade by a slim margin. So, while I’m sad to see Johnny Mac leave, this does appear to be a good move for the Jays overall. When John Buck got hurt, the Tao of Stieb beat me to the punch on Twitter to register his excitement about J.P. Arencibia getting his shot with the big boys. For this, he was called an idiot. Who’s the idiot now? 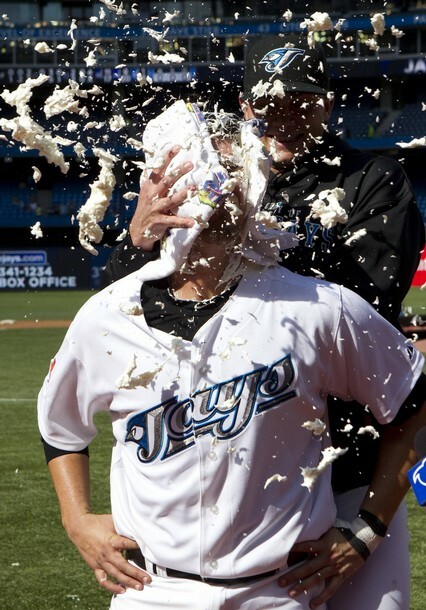 Without doing any research at all, I’m going to go ahead and call Aaron Cibia’s MLB debut the best of any player ever. In case you missed it, here’s the video of his amazing day at the plate. The most impressive thing that Arencibia did, to me anyway, was to make the usually-moribund crowd at the SkyDome come to life. Sure, the 8 home runs the Jays hit in total likely had something to do with it as well, but make no doubt: Arencibia was the star of the show. Aaron Hill also hit two dingers, but didn’t earn a standing ovation for every at bat. The Catcher of the Future Now even earned a bit of a standing O when he flied out to right in his last at bat. I stuck around for a little while after the game and I saw the nice moment J.P. had with his mom. Their hug was nice, but as I saw Mrs. Arencibia walking up the aisle, she was wiping tears from her eyes. As much as a scene involving two strangers being emotional about something that ultimately doesn’t matter can touch me (and that’s an unreasonable amount) it did. I’m happy as a Jays fan, but I’m even happier for J.P. and his mom. I usually watch the games from the 500 level. The seats are good enough and cheap enough that I’m more than happy to watch from above. Today though, I used my voucher from the relocated Phillies series and got a prime seat behind the Tampa dugout. Other than the Jays offensive masterpiece, the most enjoyable part of the day for me was watching Yunel Escobar play shortstop. Watching from the 500s, you can see the great plays he makes. Watching close up, you can see how much fun he has doing it. Great players are impressive, great players who play with a smile on their face are something else entirely. Escobar has fun out there and I love it. Watching him toy with B.J. Upton when Upton was on second was great fun for me and it looked like for both of them as well. If Arencibia and Escobar are both here for the long haul (and there’s no reason they shouldn’t be), we Jays fans are going to be in for a real treat. • Coming off the dismal series against the Royals, I was a little worried at what was going to transpire in this weekend series. Doc’s first inning on Friday (specifically the Nick Markakis dinger) did nothing to make me feel better. Doc’s next seven innings, and the performance of the offence in general, relieved me of any worries I had. • Crowd cheering Gregg Zaun in his first at bat of the weekend? Classy. Crowd treating Zaunn like he’s a Yankee after that first at bat? Horseshit. Whatever you think of Zaunn, this is a guy who loved playing Toronto and didn’t want to leave. He doesn’t deserve the hate. • Details from the rest of the game are a bit hazy, but I do remember Adam Lind hitting a mammoth bomb to straight away centre and I remember that Scott Downs finished out the game. By the end of his 5-2/3 innings, Ray had gone a long way toward winning me over. Like his ice-bound namesake, he seems pretty scrappy. Fighting through some awful innings in a major league debut to put in an overall good performance (4 hits, 4 walks, 3 ER), I hope this guy gets another shot. • Hey, Cito, I know you make the team win and I like that, but I’ve got a question for you: Why the hell do you stick with your lineups through thick and thin, never pinch hitting because it might destroy confidence, etc… Why do you employ that philosophy and then, in the bottom of the 8th, with the bases loaded in a tie game, you pinch hit for Overbay? Seriously, does Millar give you something Overbay doesn’t? What, he does. He gives you a downgrade defensively when he doesn’t come through at the plate and the game goes into extras. And what is Overbay supposed to take from being pinch hit for? Cito’s apparently got faith in every other hitter on the team, but not him. Or is Lyle just so mentally tough that it won’t get to him at all? • Seriously, why do the Jays fans boo Zaunnie? • Aaron Hill: On his way to becoming Greatest Blue Jay Ever. I’m convinced he screwed up that play at second just so he would have the chance to tie the game with a dinger in the 10th and then drive in the winning run in the 11th. • I didn’t see this game, but I didn’t have to. With Scott (Captain Canada) Richmond on the mound, you pretty much know exactly what you’re going to get. Opponents score three runs, Jays win. Bingo Bango. • That may have been Toronto’s first series against the AL East, but Baltimore doesn’t really count, does it? • Scutaro apparently knows a thing or two about which stats people should be paying attention to. • Today is May 4. The Toronto Blue Jays are 18-9. The Toronto Blue Jays are leading the AL East by two full games. The Toronto Blue Jays are not going to be jinxed by me saying the P-word. Not today. The Toronto media, when it comes to the Maple Leafs, is notorious for planning parade routes after a win, screaming that the sky is falling after a loss, and doing its best to run superstars out of town (see Sundin, Mats). To a lesser extent, the same is true of its coverage of your Toronto Blue Jays. The worst seems to always be expected of this team, regardless of how they’re playing and how the team is actually being run. Mike Wilner, of course, is a notable exception. He provides balanced, realistic coverage of the team day in and day out. His thanks? Dealing with callers during his phone-in post game show who are all apparently brainwashed by the prevailing opinion of the local media. One of the main themes, led by a certain former Montreal Expos P.R. flack, is that J.P. Ricciardi should be fired. I’m no J.P. apologist, but some of the arguments levied against the man are just a bit ridiculous. So now, with the Jays off to a great start and sitting in first place in the entirity of Major League Baseball, it’s good to see that a media figure (other than Wilner) has actually stepped up to give J.P. some credit, even if it is indirect. Let’s run down some of the people that are doing great things in the first month of a new season. First, Aaron Hill. He does things at second base that will remind you of Roberto Alomar, meaning his glove work can occasionally take your breath away. He also leads the major league in hits and is one of several reasons the Toronto Blue Jays are in first place in the American League East. Teammates Ricky Romero and Jason Frasor are on that list, too. The Blue Jays were only going to go as far as their young pitchers took them, and so far, Romero and Frasor are a combined 5-0, but Romero was placed on the 15-day disabled list this week. All three players mentioned were brought in by J.P. — Frasor by trade, Hill and Romero through the draft. And yes, Romero is the guy J.P. drafted ahead of Tulowitzki. The Blue Jays are a model organization in some ways. That is, they’re forced to build through player development because they don’t have the resources to spring for the big-ticket free agents. When teams do it this way, even when their scouts are making good decisions, there can be frustration among fans because fans want everything done yesterday. Once the talent pipeline starts flowing, teams like the Blue Jays — and the Marlins — have a chance to remain in contention for a long time. Nice going, Blue Jays. So who is this writer who has come to J.P.’s defence? His name, appropriately enough, is Richard Justice. And he’s based in Houston. You didn’t think he’d be a Toronto writer, did you?